It may sound basic, but good storage and presentation are like adding Rudolph’s red nose to an already-stellar team of flying reindeer! Tis’ the season lovers of wine, and before you’ve primped those presents, IWA has lined up seven merry posts just ahead of prime party season featuring holiday entertaining tips sure to inspire and delight. So whether you’re the host, (or simply showing appreciation to one,) make us your go-to for unique, high-quality merchandise that will make every holiday celebration unforgettable. Cheers! Keep the Grinch at bay by taking advantage of designs and devices to fit every space, style and budget! Always store wine on its side, label-up. Group like bottles together, whether by country, varietal, winery or vintage. Color-coded wine bottle tags hang from the neck and eliminate the need to jostle bottles in tight spaces just to view labels. 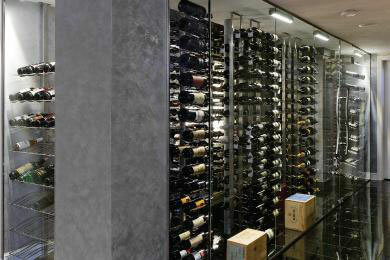 Scalable solutions—Perhaps custom-cellars leave you feeling like Frosty melting in a greenhouse? That’s why our elves have been hard at work making storage solutions for every scenario! No matter what you’ve put on your Wish List, we probably have it: from wine racks to wine cabinets, wine friendly furniture to wine refrigerators—each solution is as functional as the next and they all look just as stunning as any custom job! Lever – An all-in-one contraption that requires only the pressing and pulling of a lever without any turning, i.e. “the Rabbit”. Ah So – One handle, two straight appendages. Best for gently extracting old, crumbly corks. CorkPops – De-foil then pressure-force the cork up by stabbing with the needle to infuse air below it. *Pop*! Younger, bolder wines – pour through a funnel (90 minutes-3 hours) prior to serving. Wines around five years old – pour more gently and rest up to 90 minutes ahead. Older/ aged wines should stand upright for up to two days ahead to allow sediment to sink; then very gently pour through the Ultima Classic Decanter and Funnel Set to catch the harmless-but-bitter, gritty sediment which forms naturally over time as solids settle out of the wine. 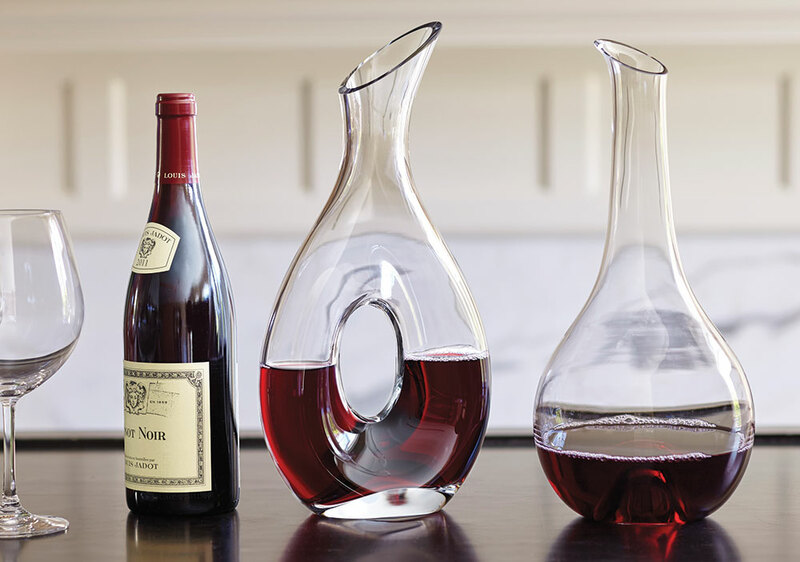 Decanted, stand up to 30 minutes—but not too long as it will peak quickly. 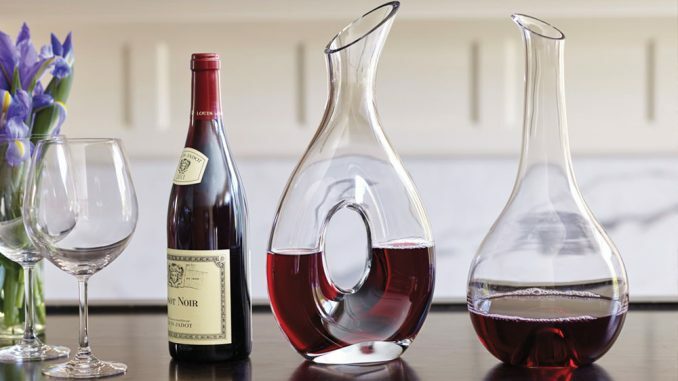 Choose from many styles such as our Shiraz Decanter which looks great on a table or bar and can be displayed upright or rotating on its side, depending on how much aeration is desired. You pulled that magnum out of storage three weeks early, it sits on the credenza next to the china, it beckons, it calls, you’re dying to pour just *one little glass* for you and your sweetie—but you can’t commit to finishing it because Oh how the guests will LOVE it. If only you can resist temptation! First, meet the Coravin Wine Access System, a device that clamps snugly onto multiple bottle sizes and inserts a medical-grade needle through the cork. 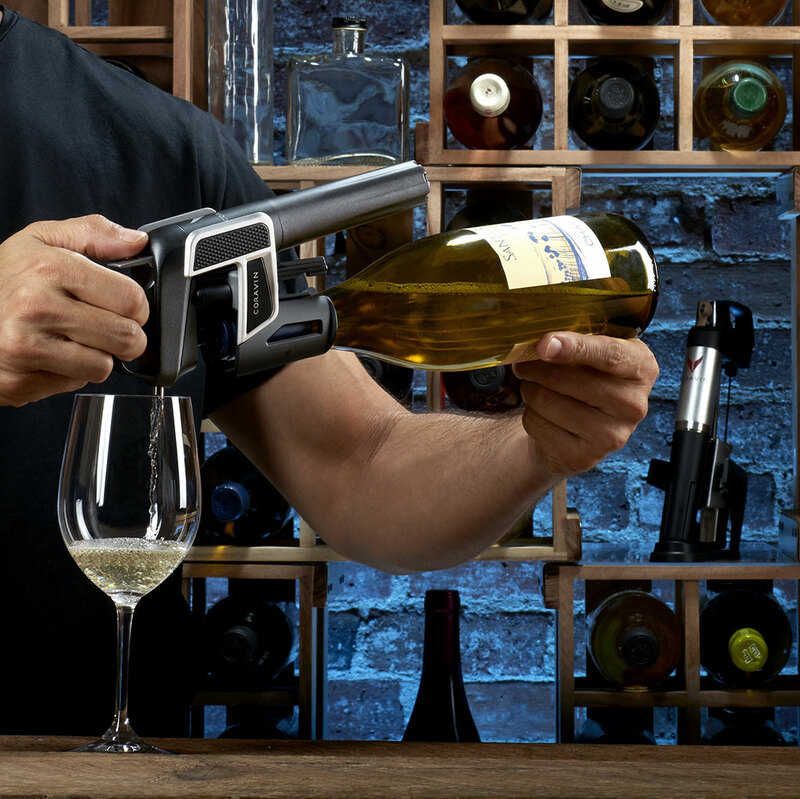 A trigger controls clean and even pouring, during which Argon gas is inserted into the bottle to preserve remaining wine (the same component used by professionals in restaurants and wineries.) Once the needle is removed, the cork reseals to simulate a perfectly-unopened bottle for extended storage. Second: the WineKeeper, a best-seller for over twenty years! This portable dispensing system uses a pressurized blanket of inert nitrogen to protect wine from oxidation. Each canister is good for up to 24 bottles. Finally, if you’re aiming simply to extend leftovers of a favorite bottle by a few days, a few sprays of Private Preserve and re-corking does the trick *tout suite*. We hope you’ll come back and share photos or descriptions of your amazing wines using any of these storage and serving upgrades with hashtag #IWAwine. It’s as easy as switching from Tic-Tacs to candy canes! Lori Stevens is a writer based in Seattle, Washington. Her book Wine: A No-Snob Guide, Drink Outside the Box ©2015 from Rockridge Press, Berkeley, CA is available at your favorite online book retailer. Many of her international wine travel articles are available on this blog. Host a Roaring 20s Wine Buffet, Fitzgerald-Style!